My first field trip with Matti Hamalainen was conducted in 2006 with two main purposes: show him the habitat of Rhinocypha orea, the species was described by him and Haruki Karube but I saw its population in nature one year before their publication appear, and the male of Echo maxima. Matti helped me very much on my first new species on editing and providing the specimen of Davidius frushtoferi from Thailand to compare and he want me helped him to see some Caloptera in nature. For the first purpose, it seems not be hard, because I took Matti to the right place that I saw the population of R. orea and that time we recorded a male that came down to the stream in the sun light. 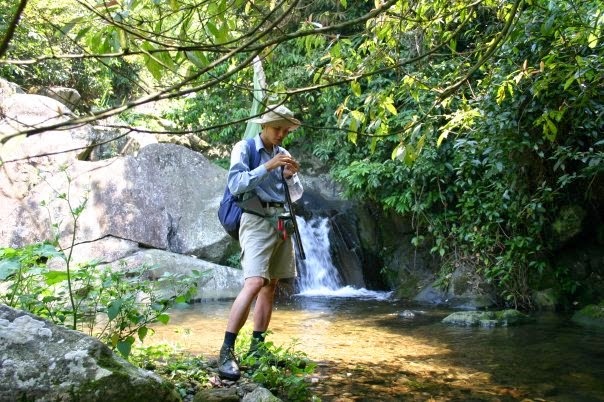 Habitat of R. orea in Tam Dao, the stream under the main Town very clean and covered by forest (photo taken in 2004, as I found a good number population of R. orea). However, up to now, the original habitat of R. orea has changed very much, since the last time I saw the single male with Matti, no more specimen of this species been recorded. The main stream already be polluted seriously and a large part of the forest has been chop down for agriculture land. But the second purpose was not easy, from the label of the holotype of female Echo maxima in Paris, the locality is Than Moi, Tonkin. Than Moi is wrong name of “Than Muoi” village, a place around Chi Lang, Lang Son, North Vietnam. “Tonkin” is French name of Vietnamese “Dong Kinh”, and it covers almost provinces of North Vietnam. I don’t know how to express the feeling as we were in Chi Lang, we went to Lang Son by train then took a taxi to go back Chi Lang, where located on the way to Lang Son. We tried to find something that did fly in a forest about 100 years ago, but all we saw is a dirty town with polluted air as well as water... Matti still keep the photo of the name board of locality, it is small town next to the railway and of course no more forests there. We spent a night at that town with emptiness thinking. The question is: where and how we can see the male of the species as its type habitat had been absolutely destroyed. It means that the species “Echo maxima” now maybe known from the only female specimen in Paris or from a short description by Martin in 1904. E. maxima is maybe a largest Caloptera of the world. 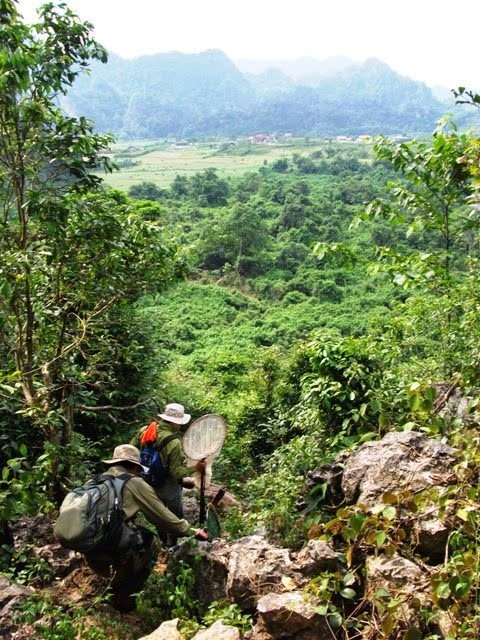 From Chi Lang, we went to Loc Binh near Mau Son area with hope to see some forest areas. We tried to search all the streams in Loc Binh but after some days, we decided not come back the area again, nothing interesting. I still remember that we did sit in front of a school after a hot day, began to say about each other life, no more Echo maxima discussion. We finished the trip for Echo maxima this year with no hoping of the success. Two year later, Matti again asking me to go for finding the rare species "maxima", he showed me a map from google earth, where only Huu Lien is green and there maybe some good forests in Lang Son. We carried out the first trip to Huu Lien with hoping about the unclear species. We search all possible habitat of the area but no information about the "maxima". 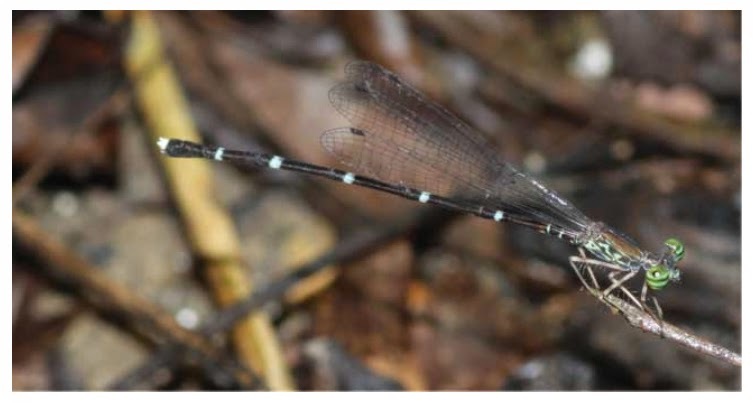 However in that trip, I found an undescribed species of Nihonogomphus that I made the description with Haruki Karube later in 2011, the species Nihonogomphus schorri. In this trip, a younger fellow joined us to Huu Lien and it was first trip of Odonatology, he then be strongly interested in Calopterygidae after that. Matti sends me today the photos that taken by him, it is a fake photo by combination from two photos, the name of photo by Matti "Cuong meets a friend" and he wrote: "Not much fake in the photo. The camera data these two photos show that the photos were taken within the same 60 seconds. The buffalo was only 10 m away". I don't believe him, I post this photo in case Matti publish it without mention it is a fake photo. All of the photos in this post are true except this one, a made photo! We went back no "maxima" one more time, the year after that year, Matti and Toan came back Huu Lien again without me, but no more information about the Calopteryx. 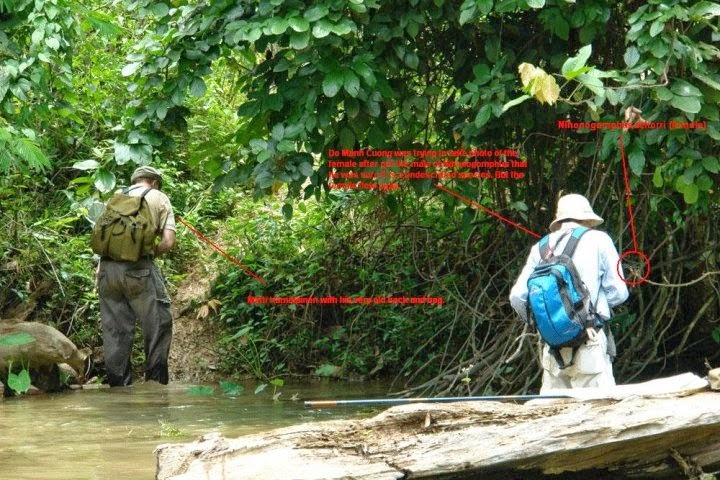 In 2010, Matti again wanted to visited and searched for the last area that be described by local people, the only site that we never been before with the last hope about finding of "maxima". 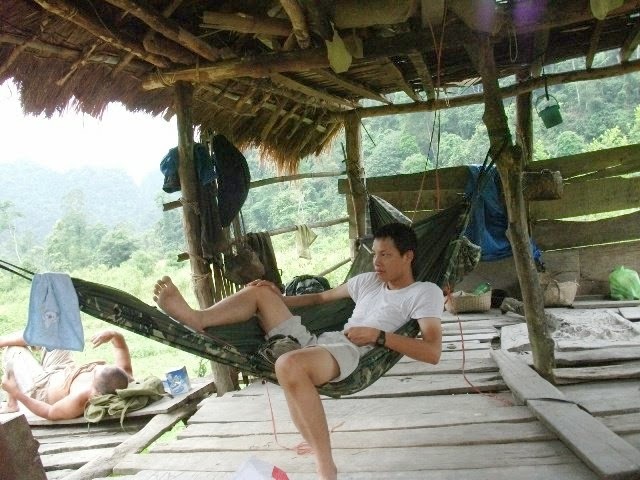 That year, we added one more member of entomologist, Nguyen Quang Thai, who will be an specialist of Vietnamese Lucanidae 2 years later. That time he joined the trip for studying parasites (mites). We tried to get the study site, as the description by local people, it is a good forest that be isolated by range of limestone mountain. It take about 1 day walking to the study site, we clam up to the mountain and get down to a valley where we going to do the field survey. The true was not same to our hope, no more forest in the area at all, we spend 1 night with a party of thousands and thousands mosquitoes around. The hot summer day just made us be tired and take a bath in a dirty stream nearby many times. In the "hotel Maxima", named by Matti Hamalainen, it was a true hut used by the local people for taking care they castles. At night, thousands visitors (mosquitoes) come for the big party. During the day, we got free sauna, terrible hot, then we did swim with buffaloes, not for cleaning but for reducing of body temperature. No more hope, we moved back hardly to the center of Huu Lien and did some survey works in the best forest near the place where Matti found a new species that then he named it after me, Platycnemis doi Hamalainen, 2012. 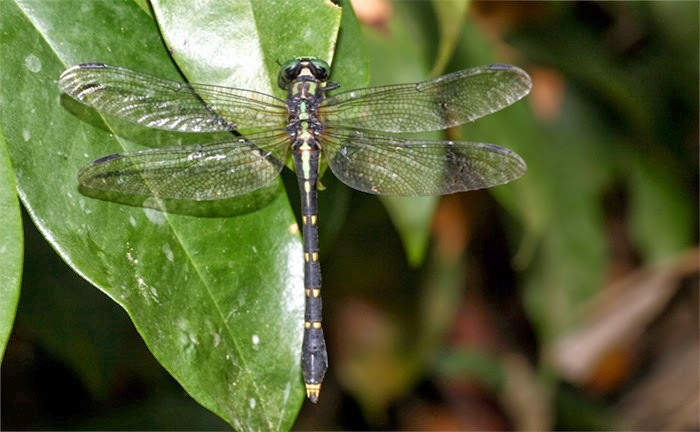 This species now move to a new genus Matticnemis. The genus be named after Matti. So name of both of us have been set together in a one species, taxonomy to be not only a game of science workers, but it is a indicator of a friendship. Matticnemis doi (Hamalainen, 2012) from type locality (Photographed by Matti Hamalainen in the original description). 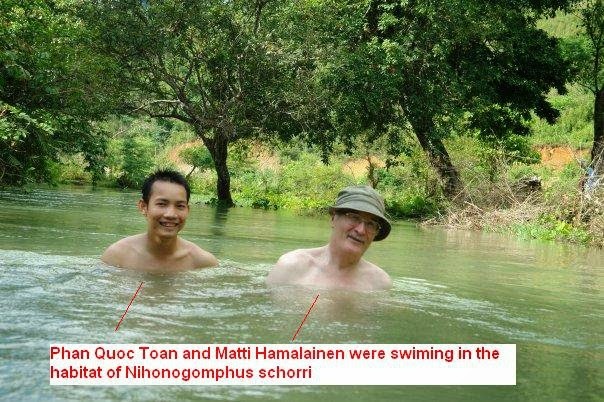 Swimming in Huu Lien, Nguyen Quang Thai and Matti Hamalainen in a hot summer day (after this trip, Nguyen Quang Thai began his study on Lucanidae of Vietnam). Much more better swimming in this situation. So the trip ending with no "maxima" but not bad result, 2 new species Nihonogomphus schorri and Matticnemis doi, additional we have a unforgettable memories. Thai learned many experience and one of them from Matti Hamalainen, keeping beer be cool in hot summer day, they did drink beer from a wet used sock... terrible for me but they seem were very happy that time.